Miranda Cosgrove (born 14 May 1993 in Los Angeles, California), is an American actress. She starred in the TV shows, Drake & Josh, iCarly, and the movie School of Rock. 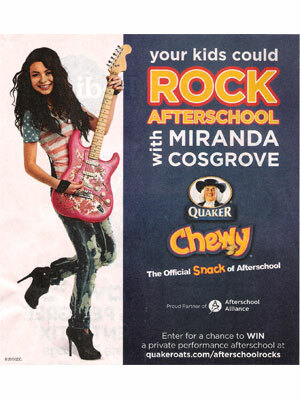 Miranda Cosgrove is a spokesmodel for Quaker Oats (2010, Afterschool Rocks, campaign), and Neutrogena (signed Feb. 2010).